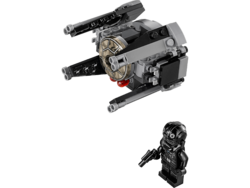 75031 TIE Interceptor is a Star Wars set released in 2014. This is a description taken from LEGO.com. Please do not modify it. 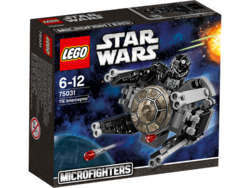 (visit this item's product page) Fight miniature space battles with the LEGO® Star Wars™ TIE Interceptor™ microfighter! Play out your own miniature LEGO® Star Wars™ space battles with the TIE Interceptor™ microfighter. This fun version of the real Imperial starfighter crams in lots of details, including 2 flick missiles and a mini cockpit for the TIE Fighter™ Pilot to sit in! So jump on and prepare for mini battle. Includes a TIE Fighter Pilot with a blaster pistol. Facts about "75031 TIE Interceptor"
Fight miniature space battles with the LEGO® Star Wars™ TIE Interceptor™ microfighter! This page was last edited on 25 April 2016, at 08:33.